Bona Traffic vs Bona Traffic HD – What’s the difference? What is the difference between Bona Traffic and Bona Traffic HD? Is there a difference? Bona Traffic is really the gold standard among water borne polyurethanes – it’s the best of the best, and I highly recommend it if you are planning to use water borne poly for your floors (you can read more about that here: What are the best brands of polyurethane? Bona Traffic is formulated to withstand commercial use with heavy foot traffic, so just imagine what it can do for your own home. But, most people don’t realize that there are 2 versions of the product: Bona Traffic and Bona Traffic HD. The HD stands for Heavy Duty. So, I thought that I would clarify the differences between Bona Traffic and Bona Traffic HD. 2. It has 40% fewer VOC’s – VOC’s stand for Volatile Organic Compounds. The basic Bona Traffic has extremely low VOC’s and Bona Traffic HD is even lower, so that’s better. It has under 125 VOC’s. 3. Bona HD Cures faster…so it’s more durable faster. Drying time is just 2-3 hours. But, note that I recommend you stay off the floors for at least 24 hrs. At this point, your floors will be much harder and resilient. Each hour that goes by in the first 24 hours makes a huge difference! Bona Traffic HD is available in Extra Matte, Satin and Semi-gloss finishes (semi gloss is the shiniest out of the 3, but it is way less shiny than a semi gloss in oil based poly. You can read more about sheen level here. My philosophy is do it right. 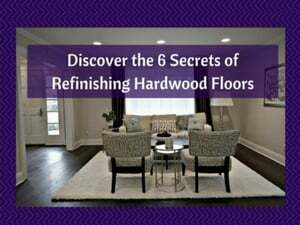 After all, it’s a lot of work and expense (and it’s inconvenient) to refinish your floors. You might as well do it right so it lasts longer and you won’t have to go through the hassle again for a long time). Most people don’t understand the difference between drying time and curing time. Polyurethane dries/cures in 2 phases. First, the thinners evaporate and the finish becomes tack free. For Bona Traffic, that’s usually a few hours (but waiting 24 hrs before walking on the floors is much safer). Then, oxygen begins combine with the varnish and the curing process starts. It’s the curing that makes the finish hard, durable and creates the full adhesion with the floor. The curing process for water borne poly can take up to 2 weeks pending on the humidity levels and air circulation. (Note: this is twice as fast as oil based poly). For this reason, I would recommend waiting 2 weeks before adding area rugs to the floor or letting your dog walk on the floor. For all you dog lovers out there (and I’m part of this group), I’d highly recommend doggie socks for your furry friend during this time. So, 24 hrs before walking on the floors (socks only – no shoes, no bare feet), 3 days before moving furniture back and 2 weeks for area rugs and dogs. You can read more here: How long does it take Polyurethane to cure). Bona Traffic is infinitely stronger than Bona Mega. It looks better (and yellows less over time), it lasts much longer (often an extra 3 to 5 years, pending on the wear and tear), it has lower VOCs and it smells less. In addition, it cures much faster and this is especially important if you have pets or kids. 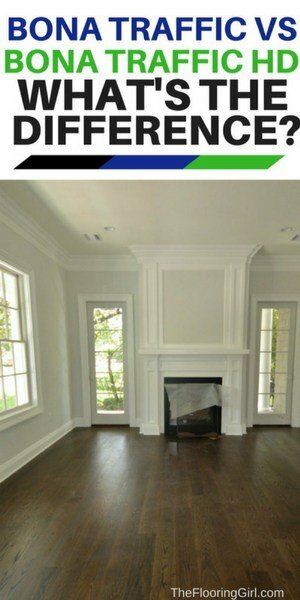 Bona Traffic is the only polyurethane I’d recommend for white washed or gray stained floors! How long does it take for polyurethane to dry and cure? After two months, I can’t get rid of the polyurethane odor. I think lots of mistakes were made that you identified in your blog by the contractor who was rushed — not sufficient waiting between coats, thick coats applied, and only two put on. To make matters worse, I’m highly sensitive to odors. To fix the problem, can I buff and then add a coat of Bona Traffic HD to eliminate the odor? I’m desperate to get a quick solution. I’m not sure if this will help and/or how much. There also may be a reaction with the poly, especially if the original hasn’t fully cured. I wish I could give you a definitive answer, but I can’t. I would try lots of strong exhaust fans. I would also talk to your contractor to see what he thinks. And, you might try Bona’s tech department to get their point of view. Can you use Bona High Traffic HD over a paint white wash? And is it okay for plywood? Adrian – I would recommend you call the manufacturer. I would never recommend using paint on the floors as it usually ruins the wood permanently as it seeps in the cracks. They also sometimes react with poly. I would call Bona to see what their tech department thinks. If you haven’t applied the paint yet, I would rethink that one. Do the Bona Traffic looks better than the Traffic HD? A local contractor told me that the standard Traffic have a more “smooth” look than the HD version. Is this true? If so, is a big difference? Marcelo – I’m not sure if there’s a perceptible visual difference between the two. HD will certainly last longer. Also, BTW, the issue could be mixing…if it’s not mixed properly, you could have that issue. My Flooring contractor is using Traffic HD on my refinished floors. He is stating that they will only require 2 coats of HD. Your thoughts on this? You are better off with 3 coats (obviously) than 2. 3 will last longer and you’ll get an extra buffing, so floors will smoother. I think it’s worth the extra cost to get an extra 2 to 3 years of life for the floor and have them be smoother. But, if the person is using a sealer + 2 coats poly, that is fine. That is the same as 3 coats of poly. My contractor has already applied three coats of Bona Traffic. Could he put two coats of Bona Traffic HD over that to create a more durable finish? I suppose you could, but I would only do 1 more coat. More than that isn’t going to do much good. Scott – It’s perfectly fine to use Bona Traffic HD. However, if you are still seeing some of old poly, you haven’t sanded properly. You need more than 1 machine and you need to do 3 times with 3 grits. If you don’t do this properly, you will have issues no matter what you use. It will sow more if you do a stain. But, even with natural, the poly won’t penetrate properly. Hi, we have 9” pine boards we stained with mineax stain and used minwax poly for the second floor we used Bona traffic Hd on the first floor we love it. We want to use the Bona over the Minwax on the second floor now can we do that? Tyke – You CAN use a water borne poly over an oil stain. This happens all the time. But, make sure the stain is fully dry. Minwax stain takes longer than duraseal, especially for dark stains. I guess I was trying to ask if we could use the Bona traffic hd over existing minwax poly we already applied. Tyke – Oh, sorry, I misunderstood. If you wait at least 6 months from when the last coat of poly was applied, you should be fine. You’ll probably want at least 2 coats. Hi we have had our floors done professionally with Bona Traffic and it is a Matte finish (3 coats). I love it but at the time we were told there is only one shine. Since searching I have discovered there is Silkmatt and Gloss. Can we apply Silkmatt or Gloss now on top of floor that is 3 days old? Anita – Yes, you can change the finish by doing a screen and recoat and adding an additional layer of the Bona Traffic. I believe the options that Bona Traffic offers are extra matte, satin, semi gloss and glossy. So you can do any one of those, based on your preference. Those are in order from least to most glossy. Brian – First, the finish has nothing to due with durablity. But, when you do a finish with less sheen, it tends to show scratches, dents and dirt less. Regarding durability of finish, it depends on brand and type. Duraseal is the best oil based finish (in our experience) and Bona traffic HD is the best water borne poly. These are EQUALLY durable. But, Bona Traffic will harden faster, so in the first week or so, I suppose Bona traffic HD would be harder, but after a few weeks, they are equally as durable. Now, other water based polyurthanes are generally less durable than oil based poly. Oil based poly give you a deeper/richer look than water. This all depends on the color you are going after. Generally with a mid to dark stain, I prefer oil based because it looks much richer and the color is deeper. For natural, very light, gray or white washed, I strongly prefer Bona Traffic HD. It looks better and more up to date and doesn’t yellow. Tom – I doubt that will work. I don’t think it would adhere properly. But, I would call the manufacturer to ask them for sure. Julia – I would call the manufacturer about this and speak with their tech department, especially since they have different lines. 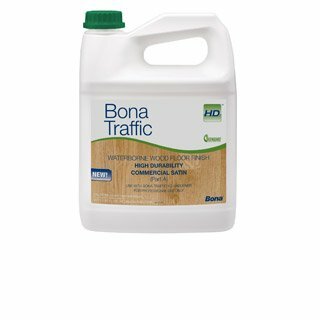 For Bona traffic HD, I believe almost all is gone after 24 and full full would be gone by 7 days since this is when they claim the product fully cures. But speak with their tech department as I’m sure they have lab results. I have a contractor telling me I shouldn’t use water based on my older floor. (house was built in 1961 and we toothed/feathered in new flooring in damaged areas) He says the water based is like glass and with the movement in my floor it will crack with jagged edges and look bad. He says the only reason another contractor wants to use water based is to save them time. I’m conflicted and cant find anything on line to support his claim but would hate to make a huge mistake in choosing waterbased Bona over oilbased. We also have 2 large dogs..will one type show more scratches than the other? Diane – I’ve never heard of that nor seen that. It doesn’t make any sense to me. That sounds like it’s a different issue related t drying/curing which can happen when the temperature/humidity is not well regulated in the home. It should be between 65-75 degrees (ideally 65-70) while floors are done and up to 30 days afterwards. If you don’t do this you can see that separation, regardless of the poly. This is important even if you are away on vacation or not living in the house yet. It is true that there are some contractors who prefer water based because they can complete the job a bit sooner, but the main benefit for that is for the customer, not the contractor. But, really this isn’t the issue at hand. The real question is the look you want, how you feel about the odor, and the drying and curing time. If you use Bona Traffic HD, you have the fastest curing time…and that means that the floor hardens faster…which means it’s less likely for your dogs can walk on the floors sooner and are less likely to scratch the floors during the firs 2-4 weeks (which is when the floor is most vulnerable. Now, one tiny downside of the Bona traffic is that is may show slightly more of a difference in color between the new and old wood vs. oil based. Oil based is more yellow so it camouflages that a bit more. but, you will may still see a difference either way. 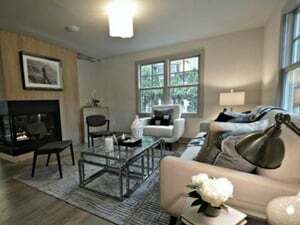 Christina – It’s hard for me to understand what your contractor is saying, too LOL (esp since I wasn’t there). Yes, 2 (or 3) coats of poly would be on top of stain. The stain acts a sealer…and it give it the color, but not protection. If it’s natural, you can do a sealer + 2 coats of poly for 3 coats of protection. Bona has their own sealer which are excellent (5 choices pending on the minor tint or lack there of). But, you do not use a sealer on top of a stain. I don’t know what multiple compounds means, but hopefully this helps. Hi, my hardwood floor is the Timberclick drift oak. I know that it is polyurethane finish, but I don’t know the type of polyurethane finish whther it is monocoat, woca oil, bona, duraseal,or loba. Does this matter if I want to apply the bona traffic on top of my floor? First, you may be able to call manufacturer to see if they know/will tell you what it is. Second, I don’t think Bona would be a problem and it probably your safest option. but, I would check w/ Bona (call their tech dept…after you know the finish on your wood…I don’t know what it is). And, bear in mind that you would usually screen or buff the floor first. But, I’m not sure how these work w/ oiled floors, so definitely call Bona and the manufacturer. If it’s new, I’d leave it. It’s already coated and the most common use for cork is the kitchen so I wouldn’t worry about it (but do get a rubber mat/antifatigue mat for sink area.). If/when your floors start to wear down, you would then buff and most likely use Bona traffic HD (I would think this is your best option, but confirm w/ Shaw and Bona – call their tech department) and make sure to hire someone with experience w/ this as you would need to buff the floors before applying and that needs to be done carefully and will remove part of the finish that’s there. You’d probably need at least 2 coats poly. I think if you do it now or just coat over it that you will make the floor weaker. But, call Shaw/US floors tech department to get their point of view. The product was designed to hold its own. I have a pre-oiled floor and the floor is about 4-5 years old. In order to make the hardwood floor more protected and new, we used a Weiman Hardwood polish and restore product on our floor. We did 2 coats. At first it was ok… but after 1-2 weeks we have white marks / discolouration all over the place. My contractor has advised that as my hardwood floor already has some protection,…. buffing first and then 1 coat of bona traffic HD would restore and polish the floor. What do you suggest? And what is your opinion? Before you do anything, I’d recommend you get in touch with the manufacturer of the original floor and ask them and ask them what they think about Weiman polish and if it’s compatible with their floor (I kind of doubt it is). Then call Weiman and get their suggestions. IMO, you will probably need to fully sand and refinish the floors and start over. It’s possible that a screen and recoat w/ Bona Traffic (w/ 2 coats) may have worked had you done that originally. Of course it would have looked different than the oiled floor, but it probably would have at least worked. Now that you have polish on the floor, you can’t screen and recoat as there are waxes in the polish. And, no I don’t think you’ll ever get the look back unless you sand and refinish with an oiled floor. (unless I’m misunderstanding here e.g.if for some reason the polish you used was compatible with the floor…in which case you need to talk to Weiman to understand why the product failed. So I believe you will need to fully sand and refinish and start over. And, if you do, you’ll need to determine if you want an oiled floor again or just do the regular way with a regular type of poly (could be oil or water based). Last week, i asked a few questions on this board. I was wondering if you could give me a hand and assist me in making a decision. Whether by postjng here or even by email, as i really dont know what to do. Hi Mike. Sorry about that. I’ve been on vacation for the last week or so (Thanksgiving). But, I did just respond to your question about 15 minutes ago. I have tons of comments/questions on here and at times it’s overwhelming. I’m just trying to catch up now,and I still have another 20-25 questions to go. Cath – First, I’m sorry about your problems and that contractor. You should call a local professional to look at the floor to see what can be done. It may be possible to do a screen and recoat (buff and add 1 more coat of poly). That will cost extra, but it’s your least expensive option, if it is possible. There is an option that only costs a few dollars more for a their slip resistant formula (which you can find on Amazon here: . BUT, you’ll need to have someone look at to see if it’s possible. He may have messed up so much that you may need to completely start over and resand the floors. This is why you need a local professional to look at it in person. Not sure if you paid the contractor/paid in full or what, but there may be options to try to get your money back (e.g. through consumer protection agency, through Angie’s list if you used them, post bad reviews, etc, small claims court). But there is not product that you can put on top to fix…except for maybe a bunch of area rugs. 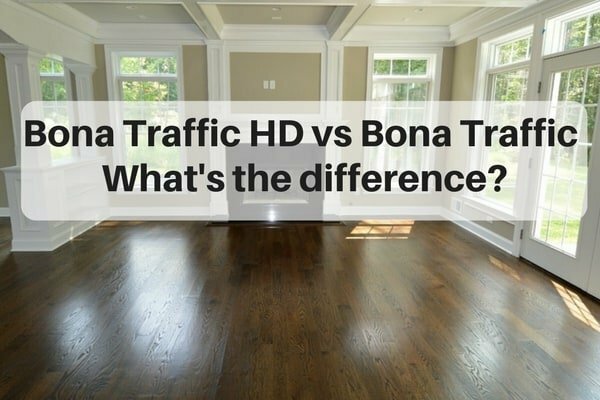 Can you tell me the difference between the Bona Traffic Naturale & the Bona Traffic HD? Is the Naturale lower VOC? Brie – There is no difference in durability or VOCs. It’s a form of Bona Traffic HD. the only difference is the color. It’s meant to look more natural. Hi Flooring girl, if I have one layer of Bona classic and two layers of Bona traffic, can I then put another layer of Bona traffic HD on this after a screening? Merry christmans to you! Wofgang – Happy holidays to you as well. It’s up to you. Yes, you can do another coat of poly after you screen or you can leave as is. the sealer acts as a coat, so you already have 3 coats in total. Thanks to you, but I mean can I put “traffic HD” on “traffic”? Wolfgang – Oh yes, that is perfectly fine. Apologies if I misunderstood. I have had Bona for 10 years and am very satisfied. Some floorboards over the years have a gap of 1mm between them (probably from normal shrinkage) is there a way to fill these in as I plan to re coat with Bona HD Traffic. And is there a preferred timber filler for Bona? Kon – You are better off leaving them “as is.” If you are just screening, then no, don’t do anything. If you are doing a full sanding job, theoretically you can add some “putty’ made w/ some of the wood sanding (this looks more real than typical fillers). But, you should know that as the wood expands in the warmer and more humid weather, it will probably pop out (or portions will). I think it looks better and more natural to leave as is…based on how it will look 1 year later. Gary – That picture was taken by a friend of mine. It looks like it’s around dark walnut or antique brown with a stain finish).